Otago Community Trust New Zealand Masters Games is proud to present the 2018 Games Ambassadors who are out there enlightening everyone about what they have to gain by being part of the Masters movement. 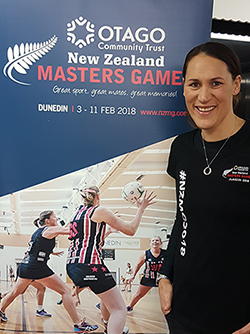 A stalwart to Professional Netball, we are very proud that Jodi Brown came on-board as an Otago Community Trust New Zealand Masters Games Ambassador for the 2018 Games. With a career spanning over 15 years playing top level Netball, Jodi’s career began in Wellington with the Capital Shakers in the Coca Cola Cup, before being sought after by almost every club in the Coca Cola Cup, National Bank Cup, and ANZ Championships over the years. During her career, she had a small hiatus away from Netball while she had two children, before returning to Netball and balancing Motherhood and being a full time netballer. Jodi was part of the World Champion Silver Ferns, who won Gold at the 2003 Netball World Cup in Jamaica. Following this, she went on to win two Silver medals in later Netball World Cups, as well as finishing her 61-test International Career with a Silver Medal at the 2014 Commonwealth Games. Jodi’s services to Netball were acknowledged with a NZ Order of Merit (NZOM) in the 2016 New Year’s Honours. Jodi now gives back to the Game through coaching St Hilda’s Collegiate, as well as co-hosting Sky Sports “Netball Zone.” Dunedin is now the place Jodi calls home, where she lives with her husband Markham and their three children. Bryan Williams was our second ambassador for 2018. The former All Black winger first got a taste of International Rugby as a 19 year old on the All Blacks 1970 tour of South Africa, where he was an instant hit, scoring 14 tries in 13 matches. Bryan scored a record 65 tries over his career, which stood for at least a decade, before being overtaken by Sir John Kirwan. After hanging up his boots after 113 games including 38 tests for the All Blacks at 28 years of age, coaching became Bryan’s passion. Auckland, Ponsonby, Mt Albert Grammar, and Samoa have all benefitted immensely from Bryan’s contributions. 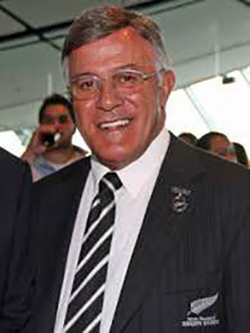 More recently, Bryan held the position of President of the NZ Rugby Union. His services to Rugby across all levels and in a variety of roles have been recognised at the highest level. In 1983, Bryan was appointed a Member of the Order of the British Empire, and in 2013 was appointed a Companion of The New Zealand Order of Merit. In more recent times Bryan was an ambassador at the World Masters Games held in Auckland in March 2017.